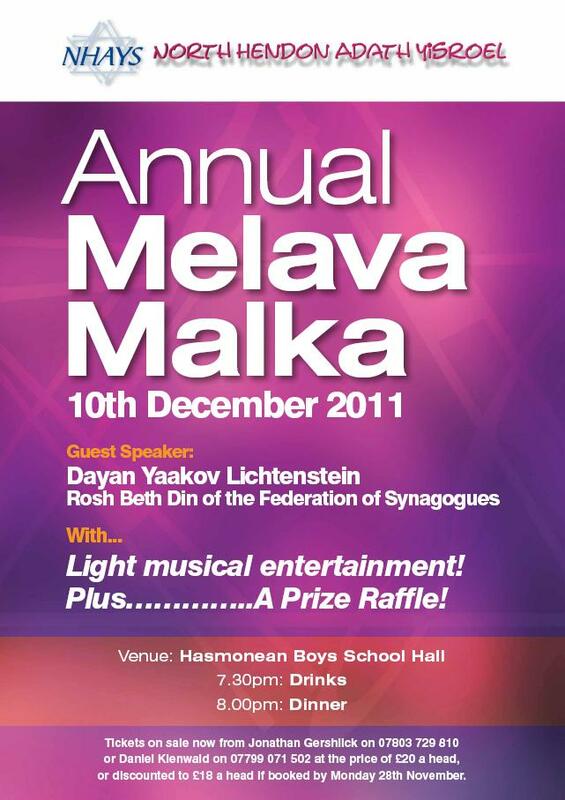 The annual Melava Malka was held on Motzei Shabbos Parshas Vayishlach 5772, 10th December 2011. Around 80 people attended, several of whom were the lucky winners of one or more of the 17 prizes in the raffle. Entertainment was provided courtesy of the Spanish and Portuguese Choir led by Eliot Alderman, and the guest speaker was Dayan Yaakov Lichtenstein who spoke about the Parsha and "A Day in the Life of a Dayan". Many thanks to the organisers, particularly to Jonathan Gershlick, Daniel Kienwald and David Freedman. Thanks also to all those who sponsored raffle prizes - a list will be published here shortly.